Johnny Ace 25, died on Christmas, 1954 when he shot himself during a break between sets in Houston, Texas. 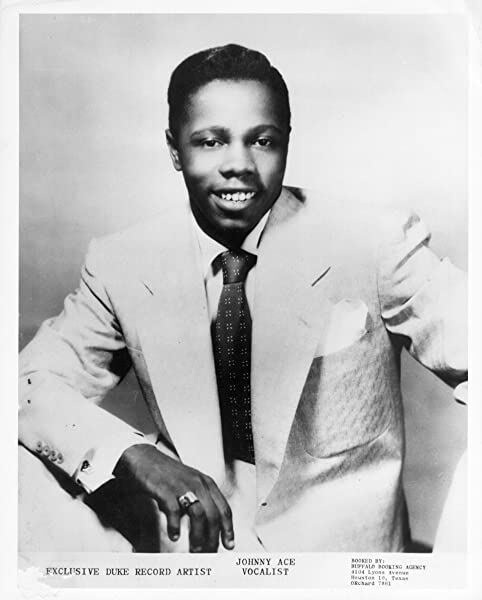 Johnny Ace an up and coming rhythm and blues singer had it all going his way until he shot himself on Christmas of 1954. For some reason Russian roulette is identified ,as the cause of his death. However two eyewitnesses tell a different story. Thornton said in a written statement (included in the book The Late Great Johnny Ace) that Ace had been playing with the gun, but not playing Russian roulette. According to Thornton, Ace pointed the gun at his girlfriend and another woman who were sitting nearby, but did not fire. He then pointed the gun toward himself. The gun went off, shooting him in the side of the head. There has been speculation that Ace was murdered, but after reading the two eyewitness accounts of Tillman and Thornton, that seems impossible since neither mentions anyone else having a gun. What we do know for sure is that Johnny Ace was born June 29, 1929 in Memphis, Tennessee and that he was born John Marshall Alexander, Jr. He later changed his name to Johnny Ace and appeared to be on his way to a successful recording career, when fate intervened and ended his life before his career could take off. Johnny Ace singing Pledging My Love which became a posthumous No.1 hit. Ironically, his biggest hit Pledging My Love was released after his death and was at the top of the Billboard R&B charts for ten weeks beginning on February 12, 1955. 56 years later the song is still being recorded and is one of the most recognizable songs among rhythm and blues fans. Singer David Allan Coe sang Pledging My Love in concerts relating how he heard the news of his death. Elvis Presley recorded it during his last recording session in 1976 on his Moody Blue album. The memory of Johnny Ace will live on as Pledging My Love will continue to be sung for years to come in concerts and on albums that have yet to be released. His real name is John Marshall Alexander, Jr. His last name is not African alone, but the last name came from landowners. Thank you for the info on the real name of Johnny Ace. You’re welcome! May his memory be eternal! His career ended way too soon with his tragic death. LOVE the words.Been a long time since I heard it. Pledging My Love went to No.1 on the R&B charts, after Johnny’s tragic death. Elvis Presley recorded Pledging My Love in his last studio session in 1976. Thank you for sharing the song about Johnny Ace. He died way too young. I was born in 1945 so I remember Johnny Ace very well. I got just about all his records. I remember that tragic day.From what I read in the newspapers back then, was that his girlfriend bought him that gun for a Christmas present. It was so sad. RIP Johnny Ace. PS. No one can sing his songs like him. Marshall, Thank you for posting. Very sad ending to the life of Johnny Ace. Why then don’t they put the word accidental in the headline. Very misleading. Couldn’t find the Johnny Ace album on Vogue label. All I could find were his Duke label albums. One of his Duke albums was for sale at eBay for $599. Not sure where to find that one. Hope you find it.